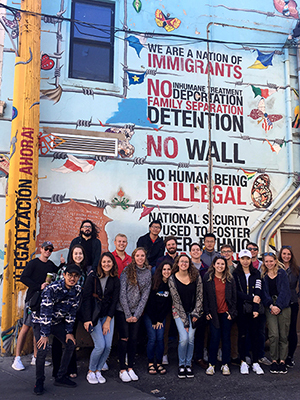 GEO 493 students pose in front of street art in Chicago. While geography and urban planning majors learn so much in the classroom at Miami, geographers and planners learn best when they're working in the field. However, it takes a lot of planning and support from outside sources to make this possible for Miami students. Every year, assistant professor of geography Damon Scott teaches GEO 493 - Urban Field Experience, a geography capstone in which urban & regional planning (URP) majors travel to Chicago for two separate weekends. The goal of the class is for students to learn about contemporary urban planning issues from community leaders, planning professionals and neighborhood organizations. "The Chicago Field Experience was an incredible opportunity that brings students into neighborhoods that are discussed in a classroom setting, but rarely explored in person," said Cooper Mason, an urban and regional planning major (with a sustainability co-major) who took this class. "The ability to interact with individuals from the community provides a better understanding of the urban problems these communities go through and how they are affecting real people." According to Scott, the goal of the first travel weekend is to relate a broad range of challenges and concepts of urban planning to particular instances where they impact particular people and places in Chicago. "The 15 students in the class orient themselves with the city through a series of interpretive walking tours through multiple neighborhoods," Scott said. "They also meet with local leaders in formal presentations and discussions about contemporary planning issues." During the first weekend in Chicago, students are encouraged to narrow down a research question that they will use for their capstone project. Upon their return to Oxford, they work with Dr. Scott to refine this question. Once they have their topic solidified, they survey literature on the topic and develop a field research plan. The second trip to Chicago includes more site visits as a class but allows students more time to focus on their individualized research. Students are given time to spread out to different parts of the city to collect field data for their capstones. These projects range in a variety of ways. Some students conduct field activities to look for patterns in how people interact with each other or utilize urban infrastructure. Others interview with local community leaders, planning professionals, or organizational representatives. Some collect field data by mapping an aspect of the built environment or by administering short written surveys to gather attitudes from the public. "I am always very pleased and impressed with the ability of students draw on their own knowledge, experience, and personal interests to imagine, organize, and execute an independent, field-based research project related to a contemporary urban planning challenge, problem, or opportunity," Scott said. All the students in the class choose a project topic based on their personal interests. Sam Plante, who is currently enrolled in the class, is writing his capstone paper about preserving legacy businesses as communities go through gentrification. Aries Song, another GEO 493 student, said the course gave him a new perspective of racial problems in urban areas. He chose to explore this concept in depth for his final capstone paper. But getting students to Chicago isn't easy, and alumni and other generous donors have helped to provide the necessary resources for the class. Donated funds are used to underwrite the costs of transportation to and from Chicago, travel expenses within the city, and lodging for faculty and students at the downtown Family Youth Hostel. When extra funds are available, they are used toward guest presenters or a cultural activity. In a recent class taught by Scott, students spent an afternoon with guest presenter José Lopez, the executive director of Chicago's Puerto Rican Cultural Center. Lopez led the class on a walk through the neighborhood and highlighted a series of commercial revitalization, social service, and cultural arts projects. 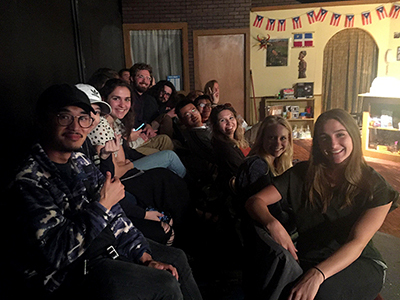 The class also went to see the play Not for Sale that explained the cultural politics and social dynamics of gentrification in the neighborhood. "It was an incredible teaching and learning moment for the students," Scott said. "The experiential value of field-based coursework is a good investment of educational resources." Donations from alumni and others help make these small yet important student activities possible. The student experience outside of Oxford allows both geography and URP majors the chance to learn and apply their knowledge hands-on, outside of small-town Oxford.